Michael Moore takes Trump Derangement Syndrome to a whole new level. This entry was posted in Global Warming / Climate Change, Hollywood liberals, Insanity, Liberals/Democrats/Left, Trump Derangement Syndrome and tagged Michael Moore. Bookmark the permalink. micheal please if this is your thinking then it would behoove you to just go ahead and jump from the tallest building and that way you won’t have to read about it and go into a TDS crash that melts your pathetic brain. Ohhh, nooo!!! 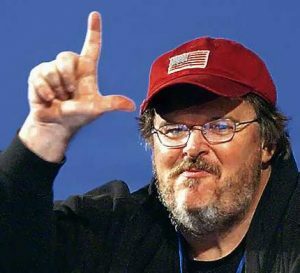 You mean Michael Moore will be extinct?, and for sure it will stink once all that lard is spread all over this land. Come on Mickey, get a hold of yourself, it’s not bad with President Trump, you brain has so much grease accumulated you don’t make sense! When was the last time anybody listen to this fool? He might have been relevant 35 years ago after his first book, but he should have stopped when he was ahead. And I do mean it: he’s a one-trick pony without a future.